When you think back to the days of mud brick houses and giant masonry stones, today’s building materials have come an extraordinarily long way. The designs of today incorporate the new age of synthetics, and for most architects, their use is a dream come true. While glass has been a valuable tool in the building industry, these added properties make it clear to see why acrylic is a safer, more economical solution. In a nutshell, acrylic is far lighter, tougher, and more easily moulded than glass, and the higher refraction of light allows for more accurate images. The lightness of acrylic keeps transportation and assembly costs low, and its ability to be thermoformed means that even the most complex shapes are achievable. Let’s take a closer look at the main architectural benefits of using acrylic. Resistance to impact and the lightness of acrylic makes the material a great choice for windows and garage doors. In the case of shaped glazing, the use of acrylic is often the only viable option. Acrylic also offers 20% better thermal insulation than regular glass, and tinted acrylic sheet can reduce solar heat and the load of air conditioning. In terms of security, thick acrylic sheets can be used to bullet or shatter proof windows in school zones and industrial areas. An acrylic door or garage door panel offers various advantages over regular glass, such as weight, strength, and thermal insulation. It can easily be mounted to aluminium, wood, or metal frames. An acrylic sheet is more than 50 percent lighter than regular glass, making it easier to handle, transport, and mount. As a result, installation costs are generally lower than those associated with glass. Acrylic can support a lot of weight and is far stronger than it may appear. It can also withstand physical impact, and in terms of longevity, is more effective than varnished hardwood. Acrylic is available in transparent, translucent, tinted, and opaque colours, in a variety of textured surface finishes. Acrylic can even be glazed, printed on, and metalised. The more choices in colour and finish means styling is made easier. Acrylic can be used for a range of outdoor purposes, such as undercover walkways, stair railings, sheds, garage doors, lighting fixtures, and more. Resistant to sunlight, heat, low temperature, and fog, it’s ideal for elements exposed to the outdoors. When light is passed through glass, it is often bent four times. With each bend the image becomes distorted, and the colour and position are no longer true. The thicker the piece of glass, the more apparent the problem. Acrylic on the other hand bends light just once or twice, allowing for a more accurate image. This makes acrylic ideal for uses such as doors and windows on garage. Acrylic is generally unaffected by most household detergents and is virtually maintenance free. Specially designed tinted acrylic can save on costs associated with heating and cooling. Acrylic can also be used to capture energy and is an ideal energy saving material. 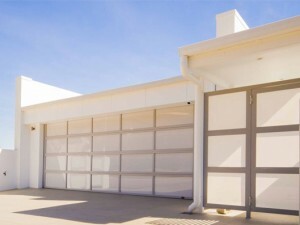 The strength of acrylic makes it a perfect choice for garage doors. Despite its glasslike qualities, acrylic garage doors offer impact resistance 250 times stronger than its fragile counterparts. Both UV stable and weather resistant, acrylic is also a superior noise barrier. Acrylic sheeting is often used on pergola roofs to provide affordable protection from the elements. Though acrylic sheeting won’t be a source of shade, it can reduce harmful UV rays and block out rain, hail, and other falling materials, while still allowing in the light. Modern architects are loving the introduction of underwater windows, and recognising how effective they can be when incorporated as a design feature. Acrylic windows can be used to filter light into the room, give a swimming pool an individual touch of style, or give a skylight a submerged effect. For an oversized aquarium – think an aquatic feature wall – acrylic is the perfect material. Not only does acrylic provide the strength and flexibility required, it offers perfect transparency for a clear image of the fish inside. Acrylic lends a modern approach to a staircase, and offers safety without obstructing the view. An acrylic railing can keep the open feel of a stairwell, perfect for open plan living. Call Steel-Line Garage Doors on 1300 767 900 today and book a FREE measure and quote or garage door service.